Tabbles Organizes Files Your Way With "Tag Bubbles"
Tabbles provides a tagging overlay for the Windows file system, making it easier to group files based on their logical relationship to each other, not their location within the disk’s hierarchy. The folder/file system has been the default metaphor since the earliest days of personal computing, but with a typical drive holding hundreds of thousands of files, organizing them rationally is difficult. Depending on your needs of the moment, you may want to see all Excel sheets from the past year, or all files related to a single project, or all of the Word documents for the four projects related to a particular client. Tabbles makes it easy to do this, if you use it regularly and with discipline. 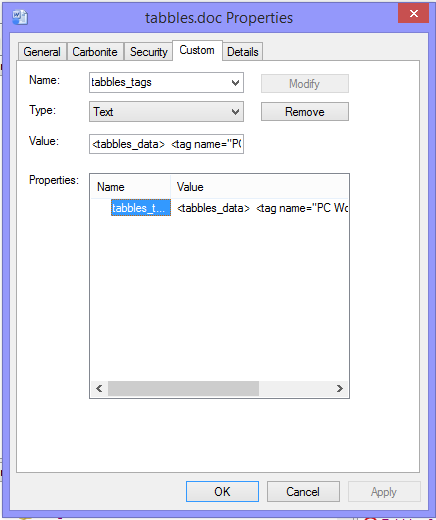 Tabbles organizes data into “tabbles”: A conceptual holding bin that is part folder and part label. Files are never moved on disk; putting a file into a tabble, or removing it, doesn’t change the directory structure. This allows tabbles to be arranged in many ways, in mixed hierarchies, without creating duplicate files. 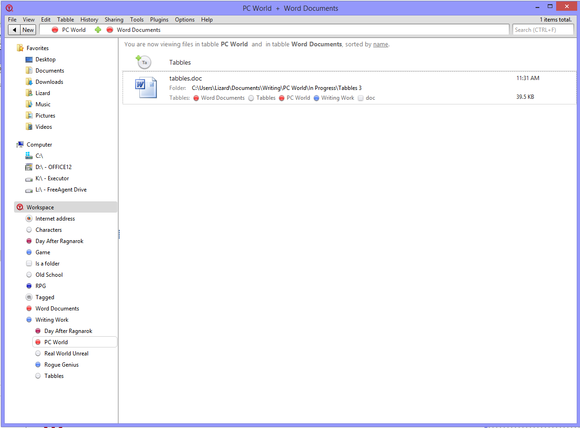 All the files tagged "PCWorld," regardless of other tags. 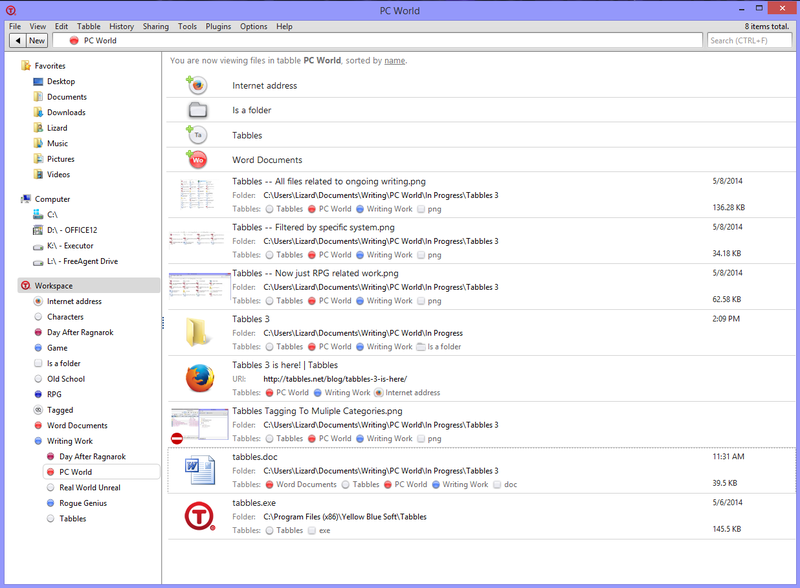 Tabbles 3.0, two years in the making, is aimed more strongly at business and corporate users, though the fact that there’s a free version for home and personal use is nice. What isn’t nice, at least for those home users, is the need to install and configure Microsoft SQL Server. It’s free (the Express version), and the setup is fairly trivial for moderately experienced users, but it’s still a bit more of a hurdle than many of those who would otherwise find Tabbles appealing may wish to jump. An alternative option is a cloud service, but this is noted as being slow and unstable. This requirement might discourage users from trying the software, which is a shame. Now, filtered to only show "PCWorld" tags that are also tagged as "Word Documents"
The SQL Server back-end does make it possible to share a tags database across networks, which I have taken advantage of. I can work on projects on my laptop or desktop and seamlessly add and tag files. Other improvements in 3.0 include embedding tags in Office file metadata, so that the tags travel with the files. Tagging can be done via right-click menu in Explorer, via drag-and-drop, or via the file browser in the Tabbles application. Tabbles now embeds metadata into Office files. Tabbles is not without issues. The first is pretty unavoidable: You need to be proactive and diligent about tagging files. If tagging is done haphazardly, the utility of Tabbles plummets. Auto-tagging rules can help with this, but that’s a second issue: The flexibility of the rules is limited. I cannot create a single rule to tag .doc and .docx files—each is its own rule. I can’t set rules based on file contents or on file attributes beyond name and disk location. Third, as Yellow Blue Soft is a small company, things like documentation and website maintenance tend to lag behind actual development work. I like Tabbles. It fills a needed niche for me, and for any user who works on sprawling projects that cross many file types and directories. It is well worth checking out if your daily work fits that description. If you work on projects spanning many directories and files, or need to organize and filter large groups of files, it's very worth checking out the trial. Installation and configuration of SQL Server required.